Secord Lake Marina is the largest Bennington Dealer north of Detroit. 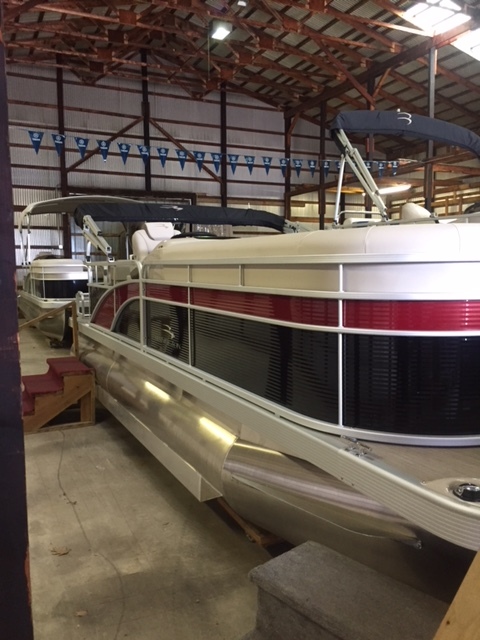 Bennington Pontoons are recognized throughout the country as not only building the highest quality pontoons, but providing the best value as well. Recognized by J. D. Power and the National Marine Manufacturer’s Association as the very best in quality, warranty service and value. Secord Lake Marina is also an authorized dealer for Playcraft pontoons. When you buy from Secord Lake Marina you receive our commitment and experience to provide the highest level of support and service. At Secord Lake Marina you can even TEST DRIVE any of our boats since we are right on the water. Not only do we deliver your boat at no cost, we also offer one year of service on the lake at your dock or seven year service at your dock if located on Secord Lake. Some more great benefits of buying from Secord Lake Marina we fill your tank full of gas, you receive a safety package and custom MC numbers. If we don’t have your pontoon in stock please call or you can also go to Benningtonmarine.com to build your dream pontoon then call us for pricing. If you purchase your dream pontoon and would like a new dock or lift for your investment we have or can order what you need. We our an authorized dealer for Great Lakes Lift & Dock.